Sgt. Adam C. Schoeller, USMC, Memorial Fund, Inc. Helping and serving those who provide support to our military and their families. The Sgt. 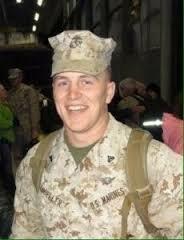 Adam C. Schoeller, USMC, Memorial Fund was created to remember and honor the life of our son, Sgt. Adam Schoeller, a crew member of the Pegasus Marine Heavy Helicopter Squadron, HMH-463. Adam was one of twelve marines tragically killed in service to country as a result of a helicopter crash during night time training operations off the North Shore of Oahu, Hawaii on January 14, 2016. Adam with his parents Laurie and Ralph during his bachelors party in 2015. That's right! Adam insisted that his mother participate. This was a fun evening. Join us in our quest to raise awareness and support for those who reach out to our military families.